So, you want to collect books by Vincent Starrett? It is clear your admiration for Vincent Starrett is only matched by your good looks, wit and the high regard in which your comrades hold you. I am but a callow youth with a fledgling interest in The Last Bookman. What books would you recommend that I hunt for as I build my own Starrett collection? Stephen, your question shows perception and wisdom beyond your years, and so I am delighted to answer it here. My own collecting started when I was in college, with inexpensive reprints and battered reading editions picked up at used book shops, library book sales and the dusty bins of the thrift shop. Today, I prefer original editions over reprints and those with dust jackets are always nice. My list of cornerstone Starrett works would differ form others and I will no doubt smack my forehead for omitting some nice piece of work once the "publish" button is hit, but that's what future blog entries are for. The Private Life of Sherlock Holmes. New York: The Macmillan Company, 1933. This is justifiably Starrett’s best-known work. "For 'they still live,' says Starrett, 'in a romantic chamber of the heart: in a nostalgic country of the mind: where it is always 1895.' " Updated, but not improved, by the author in 1960. > First Alternative edition: The Private Life of Sherlock Holmes. Indianapolis: Wessex Press, 2008. A reprint of the 1933 original with new material, including a bibliography of every edition to date. I am not ashamed to say that I edited this little volume and have been delighted by its continued popularity. 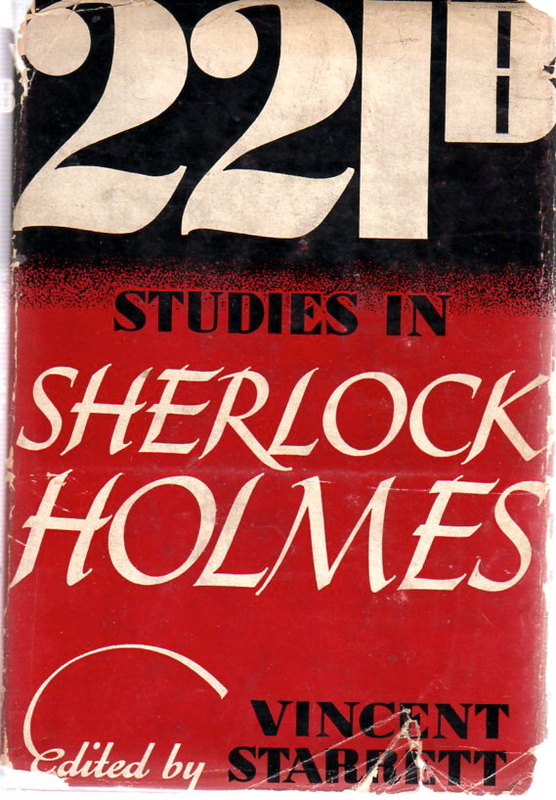 221B, Studies in Sherlock Holmes by Various Hands. New York: The Macmillan Company, 1940. > Alternative edition: 221B, Studies in Sherlock Holmes. New York: Otto Penzler Books, 1994. Penny Wise & Book Foolish. New York: Covici Friede Publishers, 1929. > Alternative editions: Buried Ceasars, Bookman’s Holiday, Books and Bipeds, Books Alive, Persons From Porlock, or Book Column. Pick one, or better yet, get them all! Autolycus in Limbo. New York; E.P. Dutton & Co., Inc. 1943. One of the constants in Starrett’s life was poetry. Long before he first wrote about Sherlock Holmes and long after his career as a mystery novelist ended, Starrett continued to write verse. I think that if he had his druthers, Starrett would want to be remembered for his poetry rather than anything else he wrote. His best poetry is collected here. Not surprisingly, Starrett included several sonnets dedicated to books and reading, including the immortal “221B”. The Quick and the Dead. Sauk City, Wisconsin: Arkam House. 1965. Perhaps it was the influence of his newspaper root, but Starrett was always a much stronger in short form writing than in his novels. Starrett’s best short stories are collected here, with the emphasis on suspense, mystery and the outré. The stories show influences of Poe, Arthur Machen and even Robert Louis Stevenson. This is a limited edition work from Arkham House, the same publishers of the Solar Pons mysteries. > Alternate: The Casebook of Jimmie Lavender. New York: Gold Label Books, Inc. 1944. Starrett’s best mystery short stories involve Chicago amateur detective Jimmie Lavender and most appeared in now obscure pulps. Born in a Bookshop: Chapters from the Chicago Renascence. Norman, Oklahoma: University of Oklahoma Press. 1965. Starrett’s memoir is heavy on the 1920s and 1930s, when Chicago challenged New York as the literary heart of America. One wishes for more details of his own life (including his wives and experiences after the 1940s, which are rushed), but there are nice tributes to Holmes and the Baker Street Irregulars. The Somnambulist and the Detective: Vincent Starrett and Sherlock Holmes. Huddersfield, England: The Northern Musgraves. 2000. This book is not an alternative, but a supplement. Susan’s excellent apprection has only one fault: it’s too short. When will Susan Rice write a Starrett biography? Seaports in the Moon: A Fantasia on Romantic Themes. Toronto, Canada: Doubleday, Doran & Gundy, Limited. 1928. Starrett had high hopes for this episodic story, which weaves The Fountain of Youth through a series of short stories that include historic and literary characters interacting. The chapter on Poe is priceless. The End of Mr. Garment. Garden City, New York: The Crime Club Inc. by Doubleday, Doran & Company, Inc. 1932. I’m reluctant to admit this, but Starrett’s mystery novels have not worn well. This one, featuring Walter Ghost, is better than most. Ghost also appears in Murder on ‘B’ Deck (1929) and Dead Man Inside (1931).